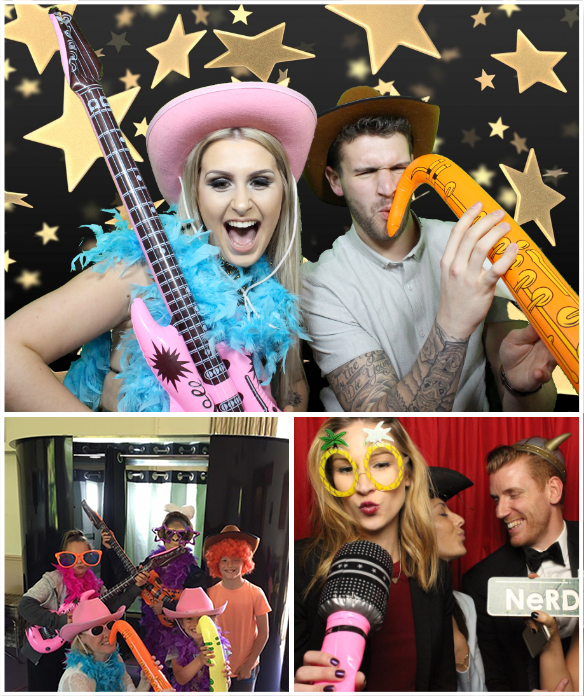 The green screen is one of our most popular photo booth services, providing an interactive experience for all ages. Transport your guests from under the sea to outer space, have their photo taken with their favourite celebrity or sporting hero. Anything is possible. Guests at your event stand or sit in front of a green screen background and have their photos taken or video clip recorded, our smart placement technology then swaps the green background with whatever background chosen. Backgrounds can be preset by you or chosen by your guests. We can also create an overlay image to match the background making your guest appear inside the scene. As always these photos can be personalised or branded, printed in seconds and/or shared on social media. 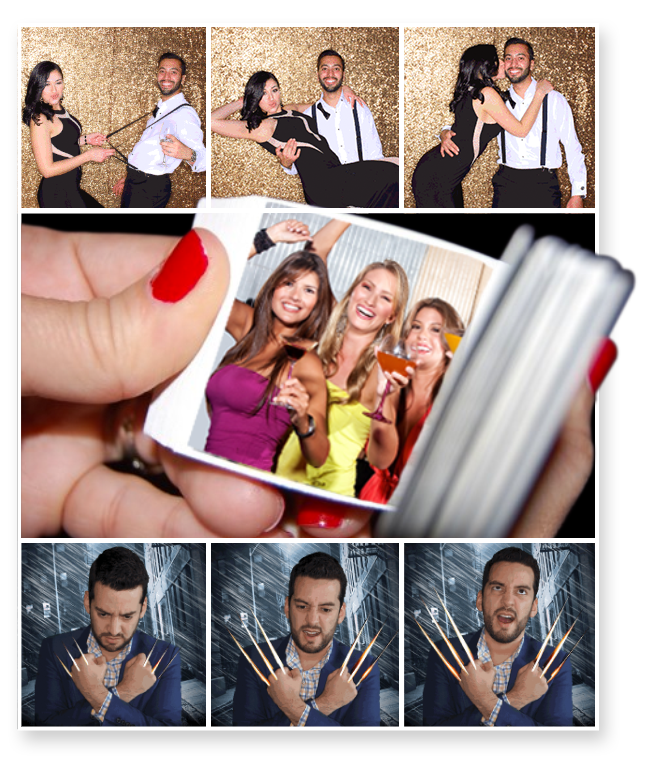 Another one of our popular photo booth services is the Animated GIFS. These are created using multi-frame animations from advanced green screen and smart placement technology. Insert your guests into a moving scene that can be easily uploaded instantly to social media or made into a 40 page flip book. We can also embed QR codes within a still image so that the animation is played when the viewer looks at the image using their phone or tablet app through a free app download. 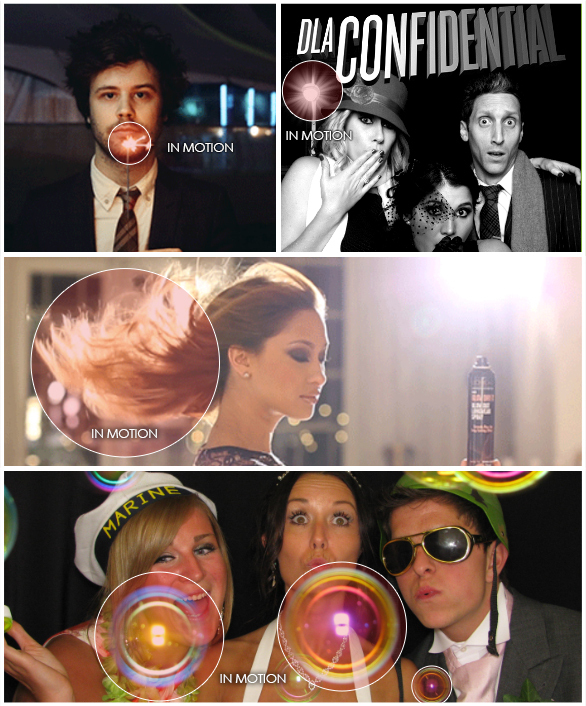 We record a 5 second video clip of your guests dancing, acting, jumping or throwing confetti and instantly transform it into an ultra cool slow motion video, easily uploaded to social media or emailed to your guests or saved to USB thumb drive. Cinemagraph is a very unique photo booth service. The Cinemagraph is a chic, ‘alive’ image created by using a small area of movement within a still image. This is brilliant for product promotion where the product is animated against the still image. 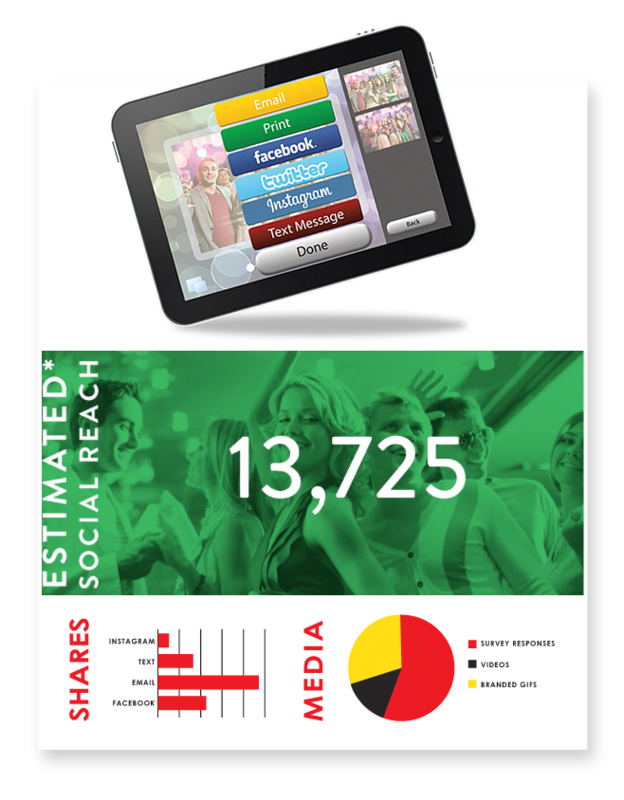 This finished result can be produced as a video or GIF which of course can be branded and shared across social media. #Hashtag Printing enables photos to be printed directly from Instagram & Twitter LIVE at your event. Guests simply take or find their photo, share with the given #Hashtag and we’ll do the rest. We can automatically print all the images and create a photo wall where guests can collect their photos or we can invite guests to choose which of their photos to print using a touchscreen monitor. We can also display a slide show of all the images with the hashtag. #Hashtag Printing is the perfect partner for corporate events creating a trend around your event online. Actively engage with your target audience both at the event and around the world, therefore increasing your brand, event or product awareness before, during and after the event. 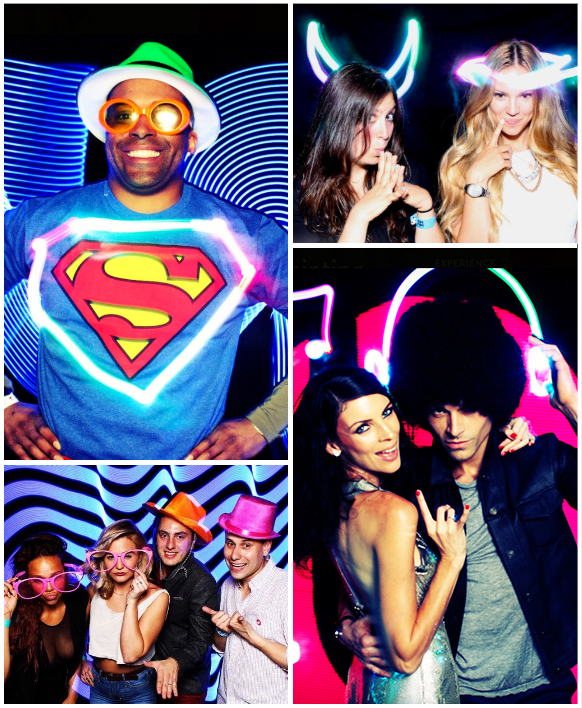 One of the newest photo booth services is the dramatic Light Painting. You guests can draw in mid air to create unique, one of a kind graphic photos. Or allow our light painting artists to create a masterpiece around you. The final product can be printed or instantly uploaded to social media, email or saved to USB drive. Your guests sing to their chosen song using the on screen lyrics and backing track. Video clips are then combines to create a fantastic video which can be shared on social media, email or saved to a USB drive. 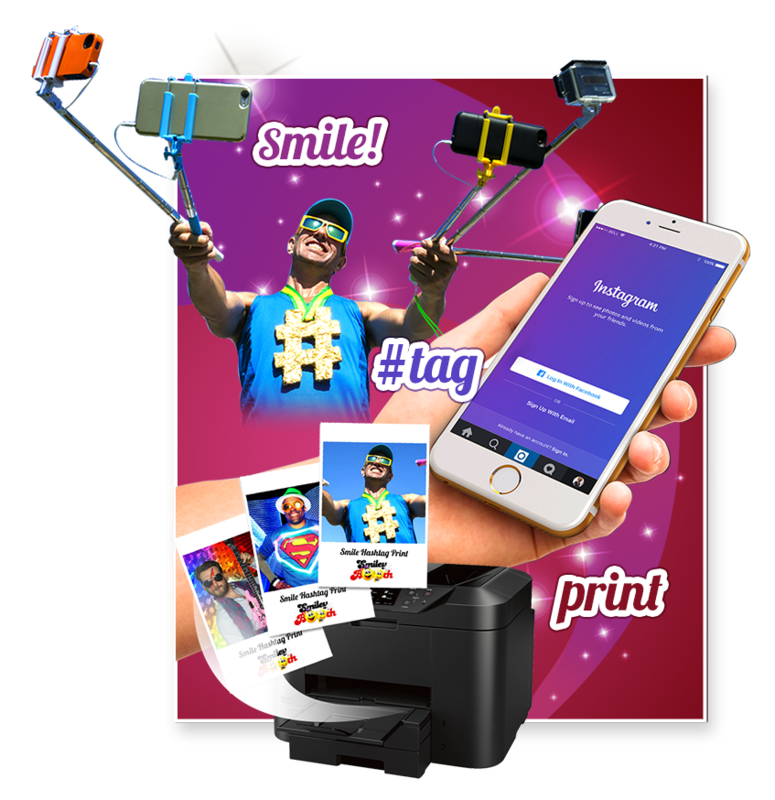 All images and videos created by Smiley Booth photo booth services can be shared through Social media, email and SMS, promoting your event, company, product or brand message via unique and engaging images. More importantly our software enables you to capture data and measure the performance of your photo experience. 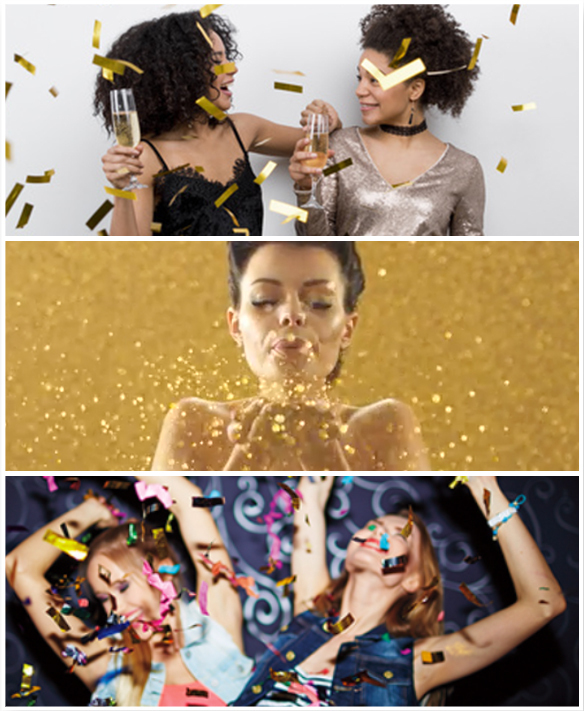 Your event deserves our full attention. 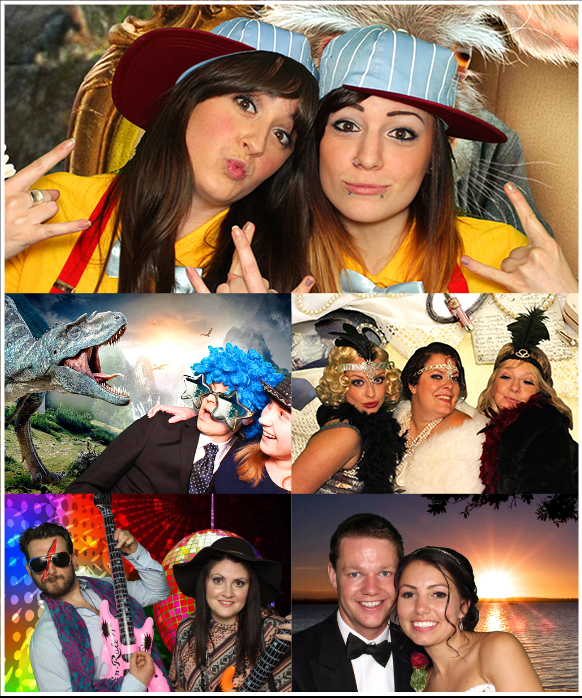 To ensure you receive our best service we limit the amount of photo booth bookings we take. This means we book up fast! Once your date is gone, it’s gone! Don’t wait, just fill in your name and email below and we’ll come back to you straight away.